Terrorism is never far from the headlines these days. One week it’s a terrorist attack, always on ‘innocent civilians’, and the next it’s a government ‘response’ to it, always ‘strengthening national security’. Somehow, governments never seem to mention that they are reducing their citizens’ freedom as they do that, but Grayling takes up the issue here. He is Professor of Philosophy at London University’s Birkbeck College and one of England’s leading public intellectuals, and he writes lucidly and persuasively. His argument, in brief, is that we have been sacrificing too much in the name of safety and that governments have been too willing to use their security powers for unrelated purposes. He writes primarily about the UK and USA but the Australian government’s actions over the last ten years have paralleled theirs closely enough that his observations largely apply here as well. He itemises the ways in which governments have limited our fundamental freedoms, especially our privacy, freedom of speech and freedom from arbitrary arrest, in the name of security, and he calls on us to oppose the drift towards authoritarianism. He admits that freedoms entail risks but argues that the freedoms are so important that the risks, which are never as great as governments claim, are affordable. If we allow ourselves to be frightened into living in a police state, he says, the terrorists have won. His focus is on political responses to terrorism rather than its roots. If terrorism is the jet of super-heated steam leaking from a pressure-cooker, we can suppress it either by attempting to seal the leaks or by turning down the heat. Given the quantity of small-arms in circulation, sealing all the leaks is patently impossible, so (even leaving moral imperatives aside) wouldn’t it be a good idea to look at the other option and begin to tackle the poverty, injustice and inequality which fuel the resentment and anger of millions of people? 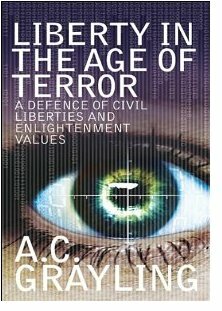 But one can’t blame Grayling for failing to do something he didn’t plan to do, and Liberty in the Age of Terror is still an important, timely book. The review you have just read was the one I wrote for the Townsville Bulletin in September 2009, just after the book was released, and I haven’t changed a word for its republication here. Sadly, the book is still important and timely – perhaps even more so. If I were to alter it now, I would add that Islam is not really the issue but has become a rallying point and a pretext for millions of desperate people living in an arc from Pakistan to Morocco, in countries which have always been on the edge of habitability and have been pushed over it by a run of bad years. We were warned repeatedly in 2010, if not earlier, and a search on “drought middle east” will generate a continuing stream of such reports and distressing images. The first wars driven by climate change? Perhaps. “In terms of U.S. defense strategy, climate change is a “threat multiplier” that can worsen national security problems such as terrorism and infectious disease spread, according to a new Pentagon report released Monday. Next Next post: What is a bug, anyway?